General Characteristics: Medium in height, well spreading, maturing within 8 to 12 months, producing from 5 to 10 oha; except for the pinkish flush near the petiole base, it is very similar to Kai Ala.
Petiole: 70 to 90 cm. long, light yellowish-green with pink flush particularly conspicuous near base, distinctly reddish at edge, light reddish-purple at apex, a reddish-purple ring at base with lilac-pink for 3 to 5 cm. above. Leaf blade: 45 to 55 cm. long, 30 to 40 cm. wide, 35 to 45 cm. from tip to base of sinus, ovate, concave, pendant, dark green; margins with numerous fine undulations; veins light green on upper surface, usually light reddish-purple on lower; piko small, reddish-purple; lobes obtuse to slightly acute, quite undulate, with fairly deep, narrow sinus. Corm: Flesh white with pink tinge particularly conspicuous at apex; skin light pink. Inflorescence: Peduncle light yellowish-green; spathe 18 to 23 cm. long, the lower tubular portion 3 to 4 cm. long, yellowish-green usually with pink tinge and reddish area at base, loosely rolled and occasionally somewhat open, the upper portion yellow, loosely rolled and open near constriction; spadix 6 to 9 cm. long, the sterile appendage 7 to 11 mm. long. Origin, and derivation of name: Native variety; the name Kea refers to the light-colored petioles. 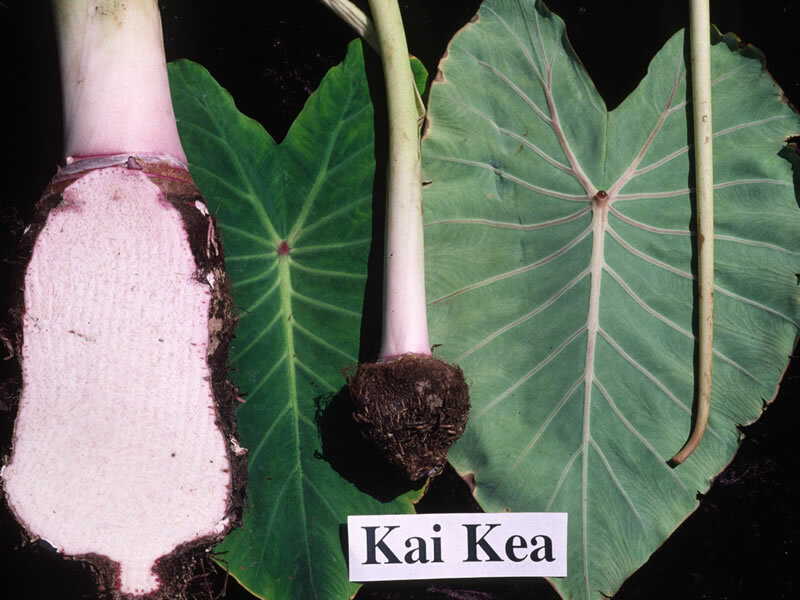 Distribution: Most widely planted variety of the Kai, grown throughout the islands but particularly on Kauai and at Waialua, Oahu. Except in a few scattered localities in Hawaii, this taro is grown under wetland culture. Use: The poi is of excellent quality and was highly esteemed by the Hawaiian chiefs.